An Alabama police officer fatally shot a 21-year-old black man on Thursday night who the police initially said shot at least one person at a mall near Birmingham, turning a Thanksgiving holiday shopping scene into chaos. But on Friday the police said evidence suggests that the man actually was not the gunman and that the true gunman remained at large. But, they said, he “likely did not fire the rounds” that struck an 18-year-old man as they had originally indicated. Another victim, a 12-year-old girl, was an “innocent bystander,” the police said. Both were hospitalized but their conditions on Saturday were unavailable. During the program's “Unplugged” segment, Noah addressed the recent shooting at a mall in Hoover, Ala. that left one dead and two wounded on Thanksgiving night. The person killed by police, 21-year-old black Army veteran Emantic Bradford Jr., who was legally carrying a gun, was mistaken for the shooter and the real shooter could still be at large. At this point, you start to realize that really the Second Amendment is not intended for black people,” Noah said. “It’s an uncomfortable thing to say, but it’s the truth. Like people will be like ‘the right to bear arms.’ Yes, the right to bear arms if you’re not a black man. If you’re a black man, you have no business bearing arms at all." 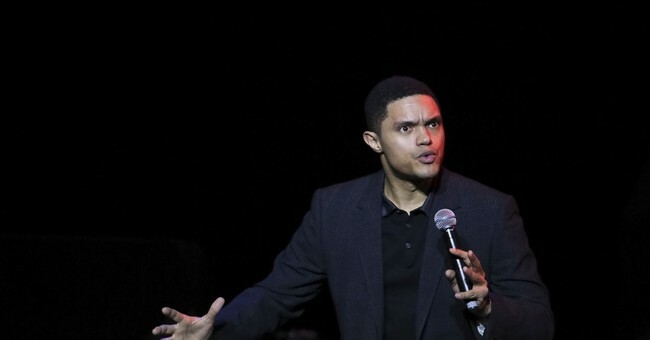 The “Daily Show” host also cited a recent incident involving a black security guard who was shot and killed after being mistaken for an armed assailant. Is this tragic? Yes. This is a total fumble by the police—and similar incidents are equally egregious. If you have to define me on this issue, yes, I would be what you would call a law and order conservative. I support law enforcement to the hilt, but I also excoriate them for when they misbehave or charged with straight up murdering people. Walter Scott and Laquan McDonald are two other instances where the police went way beyond the use of force and killed people—and those officers were brought up on charges. Both officers either plead out or were found guilty of murder charges, and rightfully so. The footage from both shootings is horrific. Now, to say that black people cannot exercise their constitutional rights to own firearms is insane. They’re citizens. They’re guaranteed rights under the constitution. They can own firearms. And there are a lot of people of color who do. There are a lot of women who do as well. This isn’t a white men only activity, which is the easiest and dumbest swipe liberals take regarding gun politics. To suggest certain rights are for some people and not others is the same nonsensical identity politics drivel that has spewed from the Left in the past couple of years. Blacks can’t own guns; white people can’t make burritos. It’s nonsense. White people can sell burritos on a food truck; the story centers on a food truck in Portland that was shut down because come people thought cultural appropriation was going on. That is another idiotic term given to us by the progressive cancers that are infesting this country. It’s the seat of irony. In the Jim Crow South, yes, rights were divided along racial lines. It was ugly, unjust, and wrong. So, to improve our social conduction, the Left has decided that…to segregate rights among certain racial and ethnic groups? It’s abjectly stupid. You see this explicitly on college campuses, where requests for safe spaces and dormitories that cater to only non-whites are made. It’s a neo-apartheid mindset. The game is the same; it’s just that the Left is quarterbacking what rights are for some people and not others. Sorry, the rights under our constitution apply to all citizens, not just some. If the latter were to stand, such laws would be unconstitutional. And yes, sadly, many such laws remained on the books for too long. This screed is just another progressive salvo to shred our founding document. As George Will once said, the main goal of the progressive Left is to render our Constitution unable to constitute because at its heart, the document prevents the totalitarian aspects needed to successfully implement a far left agenda. Gun ownership is one of those action items the Left wishes to erase.